For a variety of reasons people have teeth removed when the need arises. Loss of teeth causes excess pressure to be placed on the remaining teeth, resulting in tooth movement, cracks in enamel and discomfort while eating. When teeth are lost in your smile zone, self esteem can suffer. Advances in dental biological science allow dentist to now offer patients stable, long term solutions to missing teeth replacement with DENTAL IMPLANTS. Medical doctors have used titanium joint replacement parts for many years. A dental implant is an artificial tooth root made from titanium that is is inserted into the bone where teeth are missing. Once the implant has integrated with the bone over several months it is now ready for Dr. Bartosh to begin the restorative process. If a single tooth is missing, a porcelain or metal crown will be constructed and permanently cemented on the implant abutment. The abutment is the cone shaped extension that is secured to the top of the implant and provides a foundation upon which to attach the crown. Implants allow Dr. Bartosh to replace not only a single tooth, but many missing teeth in the form of a permanent bridge. This is as close to natural form, function and esthetics that we can get without disturbing nearby teeth. For people who are unhappy wearing full dentures due to instability and lack of retention, dental implants are the solution you have been looking for. Just ask your friends who have increased comfort and security because their dentures are supported and retained by dental implants. 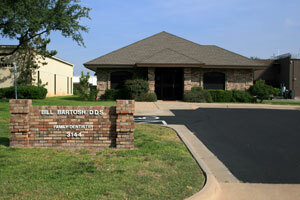 Please call today for a consultation appointment with Dr. Bartosh. We offer the level of care you are seeking to insure the quality of life you deserve.